Did you know that June 16th is Save The Bookstores Day? Mega-stores like Walmart are putting bookstores out of business and bookstores in small towns and big cities continue to close. Tara Lazar has a great post about this: http://taralazar.wordpress.com/2012/06/04/support-save-the-bookstores-day-on-june-16th/ and I hope everyone will spread the word about this event. I’ll be stopping and shopping in at one of our local Indie bookstores here in Colorado Springs, Poor Richards. What will you be doing? As a child, I was fascinated with books and I would have been happy to live in a bookstore. One day that almost happened! My mom needed to buy a junior high school graduation dress for my older sister. We went to Abraham and Straus, a big New York City department store and my mother left me in the book department which covered the entire eighth floor. Floor to ceiling bookshelves lined the rooms and tables filled with books crowded the space so there was little room to walk. Finding a little kneehole desk amidst the book strewn tables, I took a copy of Little Women by Louisa May Alcott (one of my favorites), crawled into the space under the desk and proceeded to read the entire book from cover to cover. Like many of you, when I am reading, I become one with the book and get lost in the story between the pages. So engrossed was I that I never heard my mom and sister calling for me a couple of hours later. It wasn’t until I turned the last page and stood up that I saw the store security guards, police and my mom and sister, frantically searching for me. They had been looking for an hour. You can read more about that day in a blog post I did last year. You’ll get a bonus if you go there because I was doing picture book reviews back them and you will find a review of Don’t Worry, I’ll Find You by Anna Grossnickel Hines as well as some great tips for Shopping with Kids. With summer just around the corner and kids tagging along when parents are shopping, those tips might come in handy! Today’s classic picture book pick is about as far away in time and place from the above book as you can get…but with a similar theme…listening to our parents and following their instructions. Little Two Feet wishes he had a horse. He can sing and dance and draw and swing across the river from a tree. But he can’t ride a horse because he doesn’t own one. His father suggests he go and look for one and little Two Feet decides to look in places he would go if he were a horse. In the end, a horse finds the boy and they develop a friendship based on mutual trust and caring. The story text and message is simple enough for very young children to understand and enjoy, while older kids will identify with the boy who could master many tasks and skills, but dreamed of riding a horse of his own. Ezra Jack Keats (Peter’s Chair, The Snowy Day, Whistle for Willy, etc.) is one of my favorites author/illustrators. This book is one of his lesser known illustrating gems. You will need: Construction paper, crayons or markers, scissors, glue or tape…real feathers, beads and string are optional. Step 1 Cut a strip of brown paper about 2 to 3 inches wide. Make it long enough so that when you bring both ends together it will sit on the child’s head comfortably.We used some craft scissors with a wavy design to cut ours just to give it a bit more flare.Tip: If you need it to be longer, just cut two strips and tape it together. Step 2 Using your crayons or markers, decorate the outside of the strip (the side you will see once you tape both ends together). Step 3 Bring both ends together to form the headband and tape or glue together. Step 4 Cut out several feathers using colored construction paper. Cut small slits on both sides of your feathers leaving about 1/2″ in the middle uncut. Step 5 Glue the feathers to the back of the headband. Step 6 Optional:Cut out one more feather. Then glue some real feathers to the bottom of the feather (so that when you hang the feather upside down, the bottom becomes the top and the top becomes the bottom – see picture). Add a string of beads and glue this onto the feather. Step 7 Glue this feather to the side of the headband and hang it upside down so that it will hang down when you wear the headband. 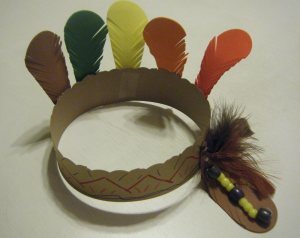 This Native American Indian headband craft is a fun kids Thanksgiving activity and has been a traditional craft for many during the holidays. However, kids will enjoy making it at any time of the year. In addition to this indian headband craft be sure to check out these Native American Indian coloring pages. Talk about different animals people can take care of…which ones would make good pets? Which ones would be difficult to keep in the city? What are some of the responsibilities a pet-owner has? What did little Two Feet do to be a good horse owner? Official website of Ezra Jack Keats with tons of info and activities. Lovely site that gives interesting background on Ezra Jack Keats and a number of activities here. This entry was posted in children's picture books, Crafting with Children, Perfect Picture Book Friday, Poor Richards Bookstore, Reading with Children, Save The Bookstores Day and tagged Book review, children, Colorado Springs, Ezra Jack Keats, Picture book, Susannah Leonard Hill by viviankirkfield. Bookmark the permalink. Poor Richards is the best! Thanks for this post, I’m glad to know about Save the Bookstores Day. Thanks for stopping by…yes, Poor Richards is a great place in Colorado Springs…awesome book finds and great atmosphere! Terrific Indian Headband project, Vivian! I forwarded it to a friend who is teaching beginning art to 3 yr-olds. Maybe I’ll see you at Poor Richards today. It’s one of our favorite places, and if we get back from Pueblo in time (graduation festivities), I’ll be there! I would have loved this book as a child. I loved to learn everything I could about Indians. And, I loved horses. Winning combination for me. Like the illustrations too. And, as always you have the best crafts. I had my own Indian headband. Back in the 50s, we didn’t play war — we played Cowboys and Indians or Cops and Robbers in the neighborhood. Loved those days of play. Great choice. Glad you liked the book…I LOVED horses as a child…still have a little poem (in my own handwriting) about a black horse that I wrote when I was about 8. 🙂 And even today I am fascinated with the Native American Indian culture! I asked my local bookstore Books a Million about what they are doing and because of Father’s Day they are just going to sell books at twenty percent discount and do anything else for bookstore day. I’m for telling everyone about it. I’m going on a personal lobby to share with anyone and everyone about Save the bookstore Day. Looks like a sweet book. I love your craft suggestion! I so often played Cowboys and Indians when I was a kid and I had made my own headdress and kind of tunic, and bow and arrows! I would have loved this story! Love the craft suggestion! Looks super cute, Jeremy will love it! What a story! Your mother must have been so worried. thanks for letting me know about Save The Bookstores Day. Oh how I love Ezra Jack Keats. He is brilliant. I can’t wait to see his talents applied to this subject matter. It seems so different from what he normally illustrates. Great post, Vivian. I had no idea it was Save the Bookstore day. I love bookstores and can get “lost” for hours in them. 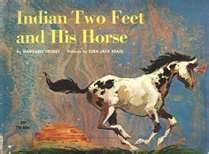 I loved reading Indian Two Feet and His Horse to my kindergartners when I was teaching. It’s a great story. Your activity is awesome! Kudos to you! Thank you for your kind words, Judy! You should check out Susanna Leonard Hill’s Perfect Picture Book Friday page…two dozen or more teachers, authors, illustrators, librarians, moms, etc..post a review of a picture book and related activities or resources and link up on Fridays to her blog…this past Friday was the last until September…but all of the hundreds of picture book reviews that have been done since January are available. Thanks, Judy…I hope you will let her know about my book also..the multi-sensory approach is especially great for helping reluctant readers build self-esteem and better literacy skills and develop a love of reading!